Jeff Stotts' Injury Analysis & Much More! Scheduled to ship in mid-to-late July. 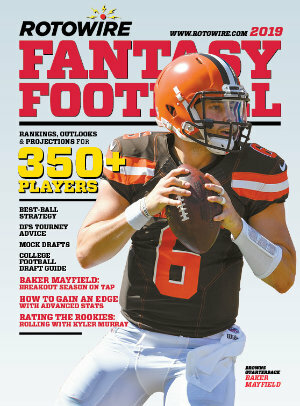 We try to publish as close to the season as possible so you have fresh information for your draft. Non-USA/Canada orders: Please email support@rotowire.com for prices and shipping rates. * We will deliver to the address listed on the payment page you fill out (not your RotoWire account). * Contact us for international shipping rates. * Order over the phone at (888) 201-3057 or email us at support@rotowire.com. We're so convinced that you'll get a lot of value from our premium subscription service that we're willing to offer you a no-strings-attached free trial.